I think we all agree that the Arrow Stunt Team do an incredible job and it’s a crime that they haven’t been recognised by The Emmys with an award for Stunt Co-ordination. Arrow fans are getting together in June to support the Stunt Team with a series of trends… in fact let’s declare June Arrow Stunts Appreciation month. This poster has been created to advertise the first trend. 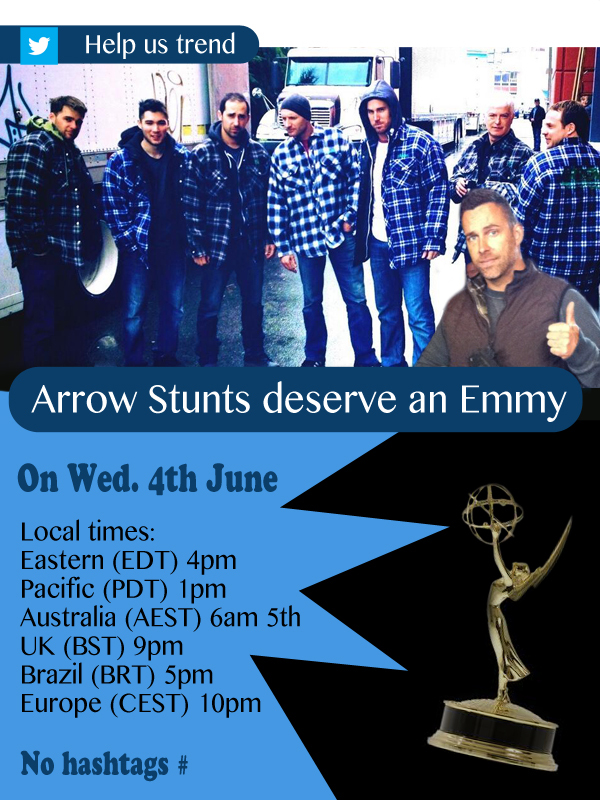 If you’ve loved the stunts on Arrow, please join in on the days listed. All you need to do is tweet the phrase Arrow Stunts deserve an Emmy on the day at the listed time. You can add a reason, link to a stunt video etc. The local times are listed on the poster above. Check World Clock Converter to view your local time. Feel free to share the poster with your social networks.